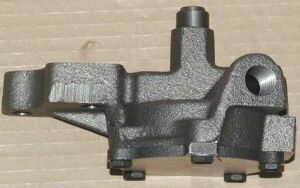 Your small block Mopar needs a high quality, dependable oil pump, to insure long trouble free life out of your engine. We offer the Federal Mogul, Sealed Power oil pumps as well as the high volume Speed Pro oil pump. The oil pump provides the life blood of your engine, oil. The pump has to provide oil in adequate volume, at proper pressure, in all situations, from cold start up, to hot, high rpm, hard running conditions. This requires a high quality pump, like the Sealed Power and Speed Pro small block Mopar oil pumps we offer. The pump has to respond, and maintain oil pressure and volume, under the ever changing conditions of automotive and truck engine operation. This includes not only changes in rpm, but also in temperature, different types and grades of motor oil and changing clearances in the engine, due to age and wear. If your engine is a street driven engine, stock type rebuild, mild high performance rebuild, muscle car rebuild, etc., then the Sealed Power pump will work well for you. For higher performance engines, race engines, hot street cars, or engines with slightly looser clearances, for higher rpm, then the Speed Pro high volume pump is a better choice for you. Please note that the high volume Speed Pro pump will not clear the back inner edge of many stock oil pans, without modification. The Sealed Power standard original equipment oil pump will install in any of these Mopar engines, with no modifications required. Click on the part numbers below for more information, pricing, or to order. When installing a new small block mopar oil pump, you should also replace the oil pump pick up and filter assembly, if one is available for your engine and oil pan. If you are using an aftermarket, not original equipment manufacturer, you need to use the pick up made to work with your pan. If none is available, you should very carefully work on your existing oil pump pick up to make sure that you can get all dirt, debris, etc. removed from the pick up before installing your new oil pump. You may need to replace the oil pump drive shaft also. On the small block Mopar, this is also known as the intermediate shaft. This shaft is driven by a gear on the camshaft, and in turn drives the distributor and the oil pump. 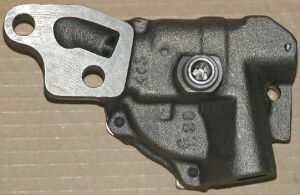 Wear on the shaft, gear, and hex end, can lead to failure, and also erratic ignition timing, which can reduce power and fuel economy or in some situations lead to pinging or detonation due to timing changes due to the wear and vibrations in the shaft being transferred into the distributor. If you did not find the small block mopar oil pump, high volume or high pressure oil pumps and parts that you where looking for, please feel free to contact us. You may also want to use the below search tools. We have had good success using these when trying to find deals on small block mopar oil pumps and parts for the 273 318 340 360 5.2 and 5.9 Magnum engines, as well as other car and auto parts.